It’s taken Audrey Regan years to establish herself as a wedding dress designer, and to date she’s been roped into creating dresses for nine of her girlfriends. Request #10 follows her vow to “Just say no!” and comes from her very best friend. She can hardly turn Carly down! Audrey arrives in Atlanta early to perform all of her maid-of-honor duties along with final fittings for a one-of-a-kind dress. But Carly’s wedding is nothing short of an event, complete with Prince Charming, and the festivities make Audrey question whether there’s a prince of her own anywhere in her future. Enter the groom’s brother and best man. Shaggy-haired, tattooed bad boy J.R. Hunt couldn’t be any more different from Prince Charming if he rode in on a Harley Davidson. Oh, wait. He actually did ride in on a Harley! 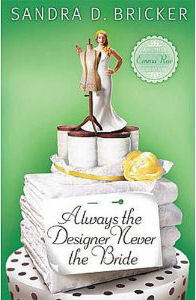 If you would like to read an excerpt of the first chapter of Always The Designer, Never The Bride, go HERE. I've read a couple of Sandra's novels and they are the perfect light read. I'm not really up for much in depth right now! They have substance and deal with some issues, but you come away with a good ending and feel like you've just stopped in on some friends for a few hours. Best to read this one in the series or you'll get a bit confused by all the characters and references to the back stories! For more than a decade, Sandra D. Bricker lived in Los Angeles. While honing her chosen craft of screenwriting in every spare moment, she worked as a personal assistant and publicist to some of daytime television's hottest stars. When her mother became ill in Florida, she walked away from that segment of her life and moved across the country to take on a new role: Caregiver. The Big 5-OH! was released by Abingdon Press in the Spring of 2010, and the novel was very well-received, garnering a couple of nibbles from Hollywood. Always the Baker, Never the Bride was released by Abingdon Press in September 2010. With its phenomenal reviews, the novel spawned a series of three more books based on the popular cast of characters at The Tanglewood Inn, a wedding destination hotel in historic Roswell, Georgia. 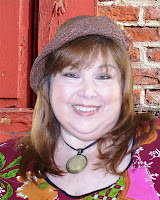 The series cemented Sandie's spot in publishing as a flagship author of Laugh-Out-Loud romantic comedy for the inspirational market. "Being allowed to combine my faith and my humor with my writing dream," says Bricker, "well, that's the best of all worlds, as far as I'm concerned!"